To what lengths would you go for a shot at the best sales of the year? Would you stand in line at 4 a.m., in temperatures hovering around zero, for the promise of new, shiny things at heavily discounted prices? If so, then you aren’t the only one, as hundreds of thousands of fellow deal hunters plan to head out across the country on Black Friday in search of the Holy Grail of sales. What you may not know, though, is that these deals can be found right in Alaska’s interior. So, hop into your room at the Fairbanks Princess Riverside Lodge, enjoy a delicious meal at Trackers Restaurant, relax and get some rest before hitting the streets for a true Fairbanks–style shopping extravaganza. Fairbanks was not always synonymous with great shopping. Most popular brands predominant in U.S. shopping malls had yet to make their debut in Alaska’s shopping centers. What more, to this day, numerous brands still refuse to ship to Alaska or charge an arm and a leg for the service that many enjoy for free or a small fee in the continental U.S. However, over the last decade, Alaska, and Fairbanks in particular, have been playing catch up and offering more to consumers with the much-welcomed entry of brands such as Barnes and Noble, Old Navy and Pier 1 Imports, as well as some favorites of the men in your life, such as Home Depot and Lowe’s. Between these retail newcomers and a community marginally effected by the economy, this year’s Black Friday is shaping up to be more exciting than ever before in Fairbanks’ shopping history. Just a short drive from the Princess Lodge, stores will be opening extra early to offer shoppers plenty of time to explore and purchase holiday gifts, from “must-haves” to those very important “don’t-really-need-but-really-want” items. Some national brands like Old Navy, Sears and Wal-Mart are giving the term “Black Friday” a new meaning and will open as early as the evening hours of Thanksgiving Day with the promise of outrageous sales and other exciting “door-buster” bonuses. Fairbanks is scattered with locally owned stores and galleries, where you will find anything from “his-and-hers” fur bikinis to Alaska Native art and Alaska-themed organic screen printed shirts to handmade scarves and jewelry. While these stores may not be able to offer the same deals as the larger chain brands, they promise to have some items set aside with special discount pricing and some, like the girls at both Fireweed Boutique locations, are waiting till the last minute to reveal the details for their sale events. If you think about it, with only five and a half hours between sunrise and sunset on Friday, Nov. 23, why not get inside to the warm and cozy stores and spoil yourself and your loved ones with something new? Then grab a hot chocolate, go back to your room at the Princess Lodge and snuggle up for a movie in bed or a good book. We can’t think of a better way to end one of the craziest days in the year. Not a fan of the crowds? Some national retailers are offering great Black Friday deals online. Get together with some friends, book a room at the Princess Lodge and bring your laptops for a fun online shopping party. While you are busy clicking away, our spectacular staff can even bring you room service. Check out our website for our own version of savings, with great room rates now available! 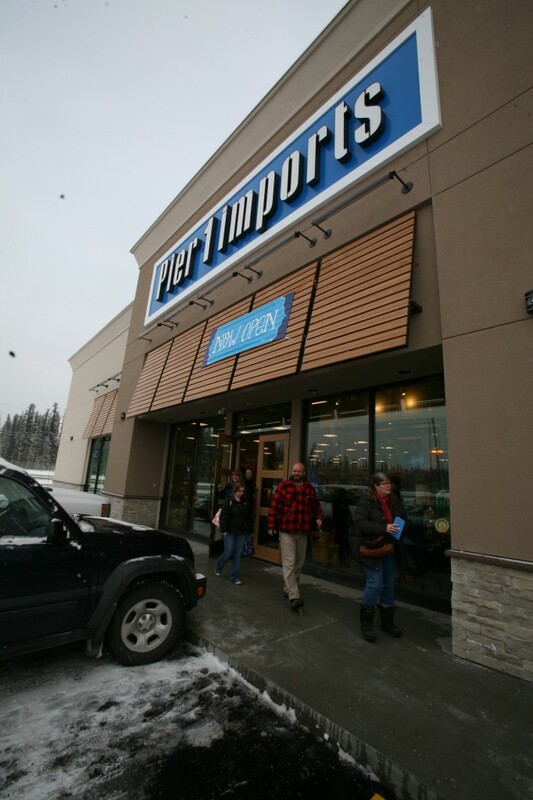 Shoppers from the grand opening celebration of Pier 1 imports, one of many national retailers that have made its way north in recent years.